When CASINO ROYALE was released in 1953 it cost 10 shilling to buy and only 4 728 prints were produced. 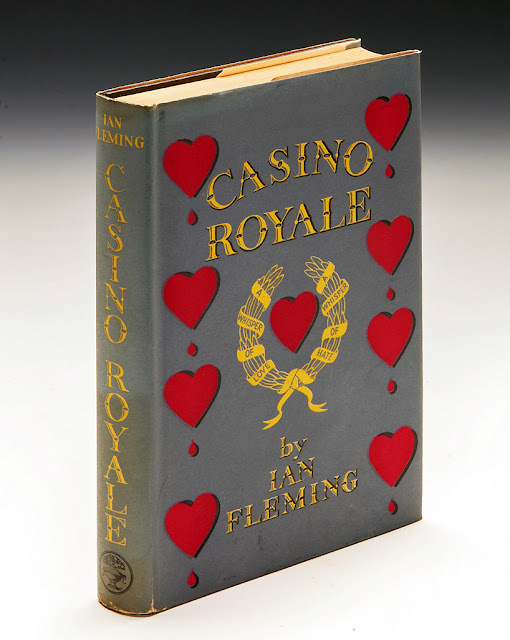 On July 12 Sothebys London had a book auction containing six lots connected to James Bond author Ian Fleming. In the end only two of them got sold. The first item to get sold was lot 159: Fleming, Ian CASINO ROYALE. JONATHAN CAPE, 1953. The book was estimated to sell for between £40.000 - £50.000. 8vo, FIRST EDITION, AUTHOR'S PRESENTATION COPY FROM THE EARLY BOUND STOCK, INSCRIBED ON FRONT ENDPAPER ("To | Ralph. |We have now both | reduced our remainders | by one copy! "), together with note of explanation by recipient beneath ("I having told Ian, from the depths of my publishing experience, that he would be lucky if he made £200 out of this, his first thriller!! R.A."), original black cloth lettered in red on spine and with heart design on upper cover, some browning and spotting, head and foot of spine very slightly bumped. Seeing these prices one can be sure that there will not be many of us fans who will own a true first edition of Casino Royale. Do you have one?